Resources for the study of all aspects of marketing and MIS (management information systems), including books, databases of journal and newspaper articles, and recommended websites. Library databases are collections of articles, reports, or information that are not easily available for free via a Google search. These licensed resources are purchased by the library and university for use by our students, faculty, and staff -- therefore you are required to login with your Rowan credentials. Click the links below to start your research on companies, industries, consumers, and more! 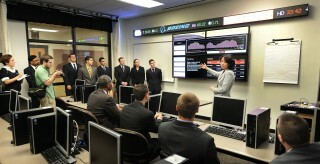 Additional databases, such as Bloomberg (terminals in Trading Room in Business Hall) and Capital IQ (online access by specially assigned username/password only) are available to Rohrer College of Business students for certain courses. Contact your professor for more information on these. POM for Excel, SAP, Stata, and other software applications can be accessed on the Rowan cloud (to access, download the Rowan Citrix client and login with your Rowan credentials). Not all marketing research questions can be answered by Google! On the pages of this guide you will find suggested databases to search, as well as specific books and journals that will be important to your research. This research guide has multiple sections, so please explore the whole site for more information. Remember to always start your search from the Campbell Library home page. Company Research is found in Mergent Online, Privco, Hoovers, and PassportGMID (see database links in box above). Also, try the ReferenceUSA Company Search Tutorial (esp. for finding local companies). In Business Source Elite, to find SWOT analyses of particular companies, choose 'Company Profiles' from top blue menu before searching, then pick company from the list. Each company's MarketLine PDF contains a SWOT section. In ABI/Inform, to find SWOT analyses, use the ABI/Inform SWOT tutorial. ABI/Inform also has a tutorial on G20 country statistics in spreadsheets. In Mergent Online, also look at the 'Government Filings' tab to find companies' annual 10-K reports to the SEC, in which they will also explain some of their business risks. (Under the 'reports' tab in Mergent Online, you will find same info as on SEC website above). Try the new Census Business Builder: Regional Edition for demographics of our local area. Choose the 'businesses' tab or the 'consumer spending' tab to see the payroll, size, and revenue of companies in our area in a particular industry, or to find out consumer expenditures on entertainment, travel, personal products and more, all categorized by county and region. Some useful market share data is in the Market Share Reporter 2019 (and previous years) in the Gale Directory Library. Use drop-down menu to scroll down to Market Share Reporter, check box, then enter your industry/topic in the box and search. ​Business Plans examples for every industry are in the Business Plans Handbook (a 32-volume ebook from Gale), which is in the Gale Virtual Reference Library database. Use boxes to search both your topic/industry as 'keyword' and "Business Plans Handbook" as Publication Title. Check out our ever-growing list of e-books and print books from the library on how to write a business plan. The popular NOLO Business Start-up books such as Marketing without Advertising are in the Small Business Reference Center database. For other ideas for marketing and adverstising classes, try the WARC database. And don't forget to prepare your business model/business plan (fall) and elevator pitch (spring) for each year's competitions at Rowan! Need to cite a business database for your bibliography? Use the tips located here http://libguides.bentley.edu/citingsources-apa (choose database name from the menu on left to get the example for each).